Now, the city’s media are joining in the outrage. In response to our revelation that PETA killed 95 percent of the dogs and cats it housed in its Norfolk, Virginia animal shelter, the New York Post editors took the radical animal rights group to task for its hypocrisy. 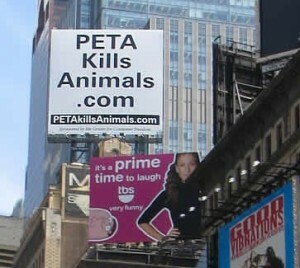 They thought its acronym fit the name “People Eradicating Thousands of Animals.” Needless to say, if PETA co-founder Ingrid Newkirk had a subscription to the Post, she has probably canceled it. The editorial also noted that millions of dollars that pay PETA’s annual budget come from wealthy animal rights foundations. As it turns out, PETA would rather spend most of money on provocative and offensive advertisements and frivolous lawsuits than protecting homeless pets. With each passing day more and more people are learning the dirty secret once hidden behind the walls of PETA headquarters. If you would like to take action, you can sign our petition to revoke PETA’s animal shelter license here.